Acupuncture has been used with increasing frequency in the treatment of drug addiction in the United States over the last 30 years, and many drug rehab centers, private practitioners and even correctional facilities employ acupuncture for the treatment of drug abuse and addiction. Although it has become increasingly accepted, there remains some opposition to the procedure and there have been few rigorously controlled studies of acupuncture's actual efficacy in the treatment of addiction. Some initial studies have presented promising findings, and a great many loosely organized studies show incredible efficacy. Personal stories also abound about acupuncture's potential as a part of comprehensive drug rehabilitation treatment programming. Acupuncture is an ancient Chinese medical technique that involves the insertion of specially designed needles into the skin to induce a desired physiological response. Acupuncture has been dated back to at least 4700 years ago, and may precede even this early date. The philosophy behind acupuncture is that the body contains a life force called Qi (pronounced chee) and that this Qi flows through the body through 14 paired channels called meridians. Proper flow of this life force is essential for correct health and balance, and when the Qi's flow is blocked or interrupted, health becomes compromised. The way to restore the flow of Qi is through acupuncture, and as such needles are inserted into varying meridians at points in the body where these meridians travel closely with the skin. 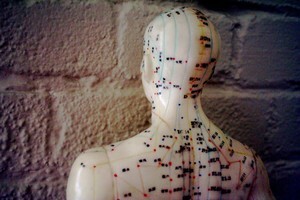 By inserting and manipulating the needles inside these meridians, the flow of Qi can be restored, and health bettered. One obvious reason for much of the reluctance from medical professionals and governmental policy agencies to recognize acupuncture as therapeutically useful originates from its philosophical use of an ancient Chinese concept of health, as opposed to modern somatic principles of western medicine.